This is the Second Edition of this popular book that teaches home hobbyists, professional studios, schools and artists how to easily, safely and inexpensively fire high quality photographs, graphics and text onto their fused glass projects. This book takes all the guess work out of this exciting new process giving fool proof step by step instructions and project ideas. Unlike other image fusing processes that require mirror image printing, this is a simple right side up application. 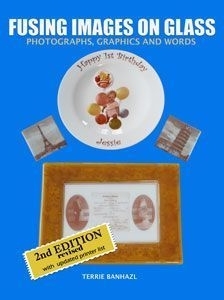 The book is filled with beautiful full color detailed photographs of exciting projects such as Wedding Invitation Plates, Family Portrait Brooches, Kids Own Drawing Tiles, Illustrated Stained Glass Panels and Treasured Family Recipe Platters. All fired images are permanent and food safe. Also included is an updated extensive List of Printers that work with this process as well as a Ramp and Hold Firing Chart for firing glass in a Ceramic Kiln plus instructions for firing images on glass using a Microwave Kiln.